Breakfast cookies. Yes, I went there. Cookies for breakfast? Why not? 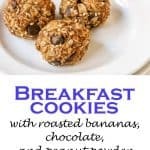 When you combine bananas, granola, organic peanut powder and a touch of sweetness with dates and a few chocolate chips, you have a great breakfast cookie. 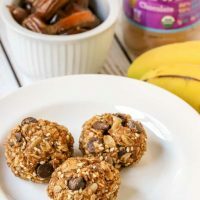 Start your day with these guilt-free bites. The chocolate version always gets my vote—use the chocolate peanut powder and include the chocolate chips. If you prefer no added sugar, use the original peanut powder and leave the chocolate chips out. Pancakes are another good way to start the day– you’ll love this recipe for whole wheat banana pancakes. Have you baked with peanut powder before? 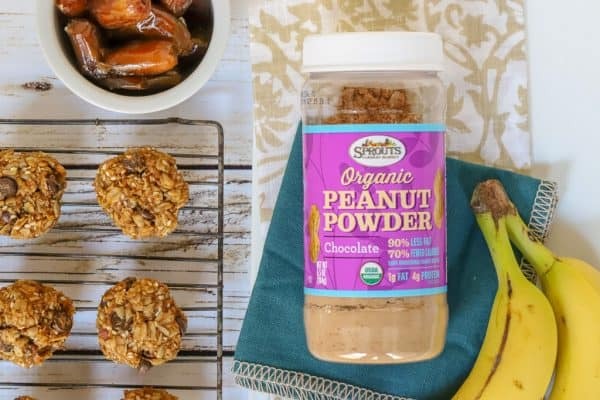 I worked with Sprouts on this sponsored post for breakfast cookies and used their organic peanut powder to add protein and flavor while cutting out the fat of traditional peanut butter. Their powder is offered in Original and in Chocolate. Since the powder is for baking, for smoothies, and other recipes, you’ll find many reasons to use this specialty product. It is gluten free, vegan and low in fat. How will you use peanut powder? Check out the recipe below. 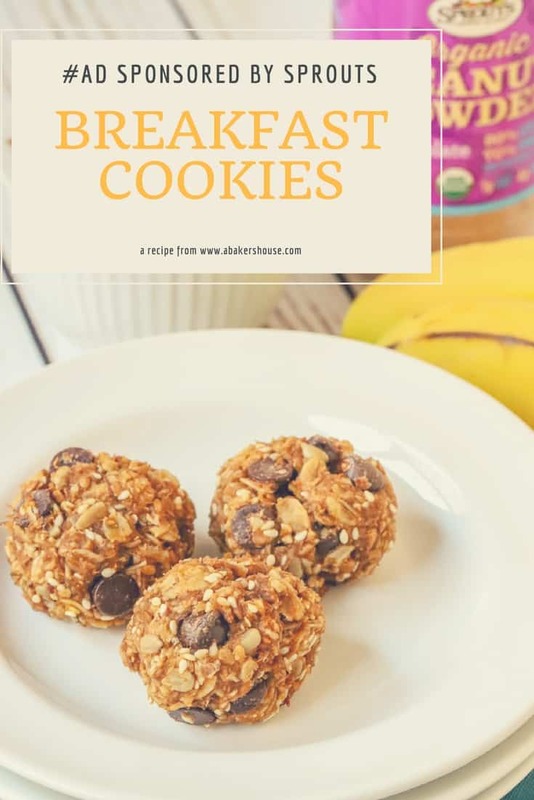 Start your day off with these breakfast cookies packed with granola, roasted bananas, dates, and peanut powder. Process the dates and water in a small food processor until a smooth paste. Spray an 8 x 8 baking dish with cooking spray. Peel the bananas then cut in half and slice lengthwise as well to create quarters. Lay the quartered bananas flat in the baking dish. Brush about 1 Tbsp. of the date puree onto the bananas. Roast at 400 degrees F for 15 minutes. Let cool for 15 minutes. 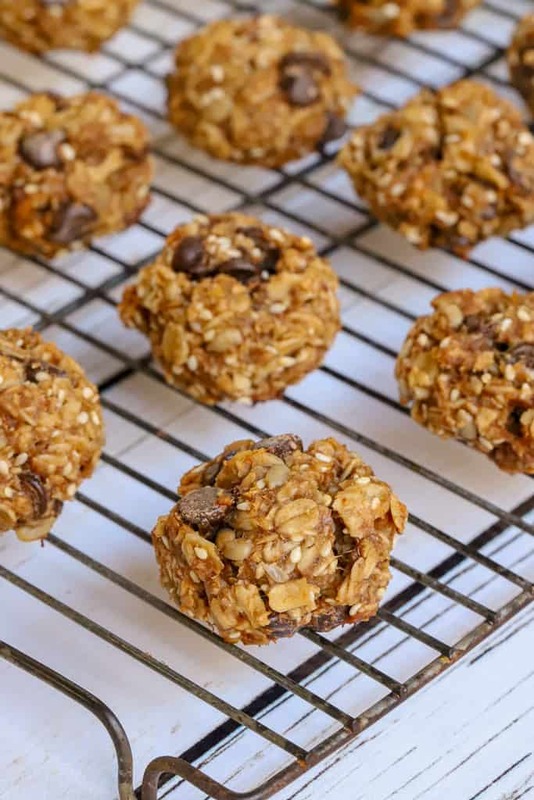 Turn the oven temperature down to 350 degrees F.
Meanwhile combine the dry ingredients of granola, organic chocolate peanut powder, baking powder, and salt. Stir to combine then set aside. In a separate bowl whisk the remaining date puree with the egg. Fold in the dry ingredients into the date-egg mixture until incorporated. Fold in the chocolate chips, if using. Take generous tablespoon scoops of the dough and form into small balls. Place on the prepared baking trays. Bake for 18-20 minutes. Cool for 10 minutes on the baking tray then move to a wire rack. Makes 30 cookies. Are you on Pinterest? I am! Join me there by saving this pin to your boards. 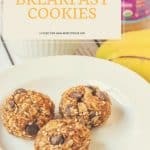 Need more breakfast ideas using Sprouts products? Try Spinach Pancakes, French Toast Muffins or Tropical Muffins. Here’s a shout out to a local Colorado company, Boulder Granola. Find their 12 oz package of Original Granola in this recipe. Here are more granola recipes you’ll enjoy! Please note that this is a sponsored post. I developed this recipe in partnership with #Sprouts Farmers Market; ingredients were purchased at my local Sprouts store. I was compensated for my participation and all opinions are my own. That sounds like a great breakfast! Great to see your posts again. Hi Ansh, I was just thinking of you this morning and checked your Instagram feed for the latest from you. Hope you are doing well!